C.W. Gortner is one of my go-to authors when it comes to historical fiction. He has a knack for bringing the setting to life and creating characters that feel real and pop off the page. This is, in my opinion, no easy task because the periods of history he covers have quite complicated political issues. So bringing that to a level the casual history fan can enjoy while also telling a great story takes real skill. I knew The Tudor Secret was different from his other books I've read, it's narrated by a fictional character and while the events that take place are based in reality much is fabricated--this is a spy novel! That didn't stop me from completely enjoying it, though. Brendan Prescott is a foundling, an orphan, raised in the Dudley household. When brought to court, he quickly finds favor with many people for his honesty and trustworthiness, which lands him a position as a spy. Fortunately, this works out for him as he is also enamored of Elizabeth the First and wants to help protect her from those scheming against her. As he works to protect her and fulfill his mission, he soon discovers his own life is in danger for reasons he never suspected. All is not what it seems. 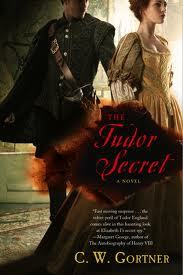 I completely enjoyed The Tudor Secret. Once again, I fully bought into the time period and world Gortner created, I enjoyed the character of Brendan and I really enjoyed all of the relationships that formed between the characters. The plot moves speedily along and I was surprised by how quickly the book passed by. While I knew the basic history involved, the story is still fresh in its telling and imagining. There's even a bit of a love story! One of the things I think is interesting about novels like this is the different ways royalty is presented. Sometimes the royalty is seen by the characters as being wonderful...they would gladly give their lives in service, while at other times the demands on their personal lives are so great, they truly resent them. Since I'd read a book that depicted Elizabeth as quite cruel, it was interesting to read this take of her as charming in her own way. Her strength obviously drew certain people to her. Even so, it's amazing with their complicated family histories that they weren't even more messed up! I recommend The Tudor Secret to historical fiction fans, but also fans of fast paced interesting mysteries set in a different time and place.